The body uses sweating as a natural way of eliminating toxins. Toxic substance build up can lead to a number of illnesses. Removing these toxins may reduce symptoms, prevent issues in the future and promote the increase of overall health. 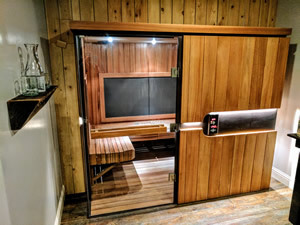 Infrared saunas are highly effective at detoxification because of the highly-efficient Solo carbon far infrared heating technology – the only technology proven to raise core body temperature by two-to-three degrees. Rather than simply heating the ambient air to draw out toxins, our sauna detox will heat your core to expel them. Infrared light penetrates deep to your core and produces a deep sweat that expels those toxins at the cellular level. Stress can lead to many physiological problems. Long term stress contributes to a number of issues like high blood pressure, weight gain and a poor immune system. It has shown the more stressed you are, the more cortisol your body produces. Cortisol is a “fight or flight” hormone made in the adrenal glands that raises heart rate and blood pressure and leads to the deposit of excess calories in the midsection. Infrared sauna therapy helps the body maintain healthy levels of cortisol. While cortisol levels stay the same or rise slightly during a sauna therapy session, they drop immediately afterward. In fact, it has been shown to reduce both systolic and diastolic blood pressure with regular use. 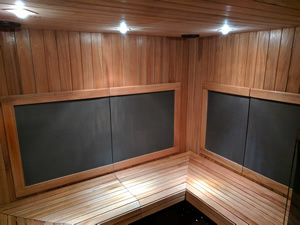 Our sauna delivers the most therapeutic infrared sauna heat per square inch (up to 99% efficient), so that you can be enveloped in soothing warmth to help you relieve stress, ease your muscles and fully relax. We want to help you relieve tension and relax muscles. Our infrared sauna works by penetrating joints, muscles and tissues, increasing circulation and speeding oxygen flow. By reducing soreness on nerve endings, our infrared heat reduces muscle spasms and helps the body heal itself naturally. Our near-infrared heat therapy helps the production of white blood cells as well. This alleviates inflammation, and reducing swelling, two key factors in easing bodily pain. It has been shown infrared sauna weight loss sessions burn up to 600 calories. During a sauna weight loss session, core temperatures increase. The body has to work hard to cool itself, causing a healthy sweat. Using an infrared sauna increases heart rate, cardiac output and metabolic rate, burning more calories, leading to more weight loss. And blood flow rises, increasing from 5-7 quarts up to 13 quarts a minute. Plus, regular use of an infrared sauna may provide many of the same benefits as regular exercise, such as cardiovascular conditioning. Yes, infrared weight loss therapy is like giving yourself a passive cardio workout. Infrared sauna use is similar to moderate exercise but “much more relaxing”. Therefore, an infrared sauna can be an effective option for those who cannot participate in traditional exercise programs as well due to medical conditions such as osteoarthritis, cardiovascular or respiratory problems. 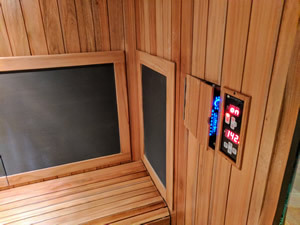 The elevation in body temperature from Infrared sauna use also produces an increase in blood flow that mirrors the benefits of a passive cardiovascular workout. Regular infrared sauna use – especially in the mid-infrared range – has been shown to significantly stimulate blood flow, even after your health sauna session is completed. Another benefit of improved circulation from Infrared sauna use is quick muscle recovery – after your regular workouts. The increased peripheral circulation from infrared heat reduces inflammation, decreases pain and speeds healing, all important steps in helping the body recover from strenuous activity. There can be significant improvements in skin appearance after just 12 weeks of sauna skin therapy using near-infrared technology. It has shown using infrared therapy may cause a reduction in wrinkles and crow’s feet, as well as improved overall skin tone, including softness, smoothness, elasticity, clarity and firmness.